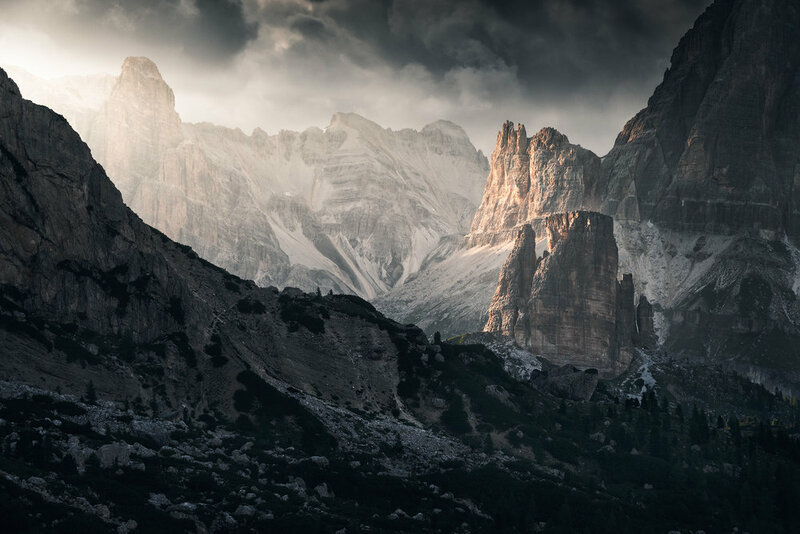 Of all the different facets of landscape photography, mountains offer perhaps the most magnificent scenery to capture and the breath-taking towers and peaks of the Dolomites are among the most beautiful mountains in the world. Rising almost vertically from dense forests and reflected in mirror-like alpine lakes it's impossible not to be both awed and inspired by the stunning vistas everywhere you look. Our workshop has two bases which allows us to cover the huge variety of landscapes to shoot here in the Dolomites. 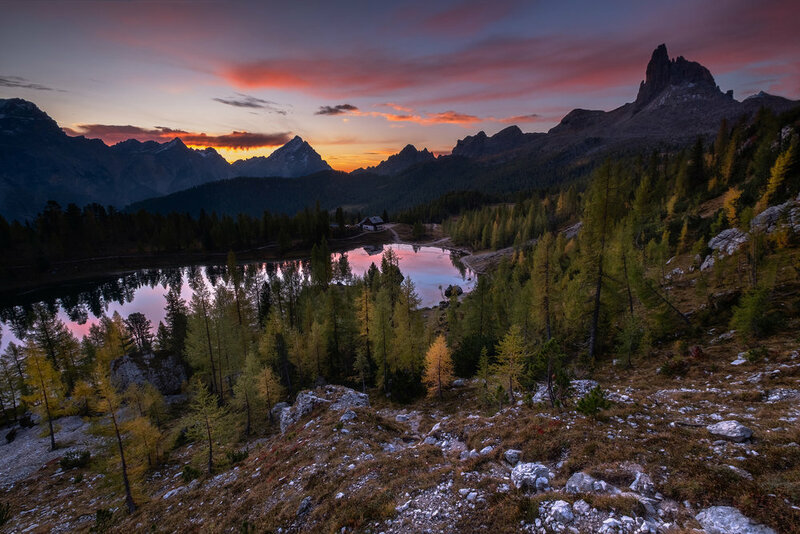 We start off with five days in Cortina d’Ampezzo in the eastern part of the region from where we can explore the stunning Tre Cime di Lavaredo natural park at both sunrise and sunset. The park has almost infinite photographic potential, from the iconic towers of Tre Cime itself, to the southern views of the jagged peaks of the Cadini group, and the area around Rifugio Locatelli and Sasso di Sesto in the north. We’ll spend multiple sessions exploring the trails and huge variety of views around this incredible place and eat hearty dinners at the mountain rifugios. From Cortina we’ll also get an alpine taxi to the picturesque Lago Federa on the Croda da Lago trail where the sunrise illuminates the golden forests and surrounding lake, spend sunset at the towering peaks of Passo Giau, Lago di Limedes and Cinque Torri, and visit the still waters of Lago Antorno reflecting the peaks of the Tre Cime above. 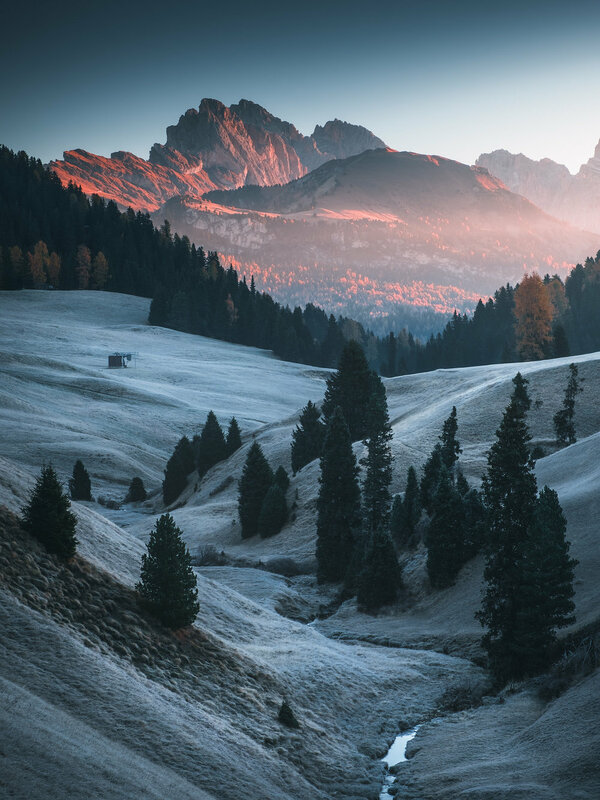 Our second base takes us west where we’ll stay on the high alpine meadows of Alpe di Siusi to see a couple of the Dolomites most iconic scenes. 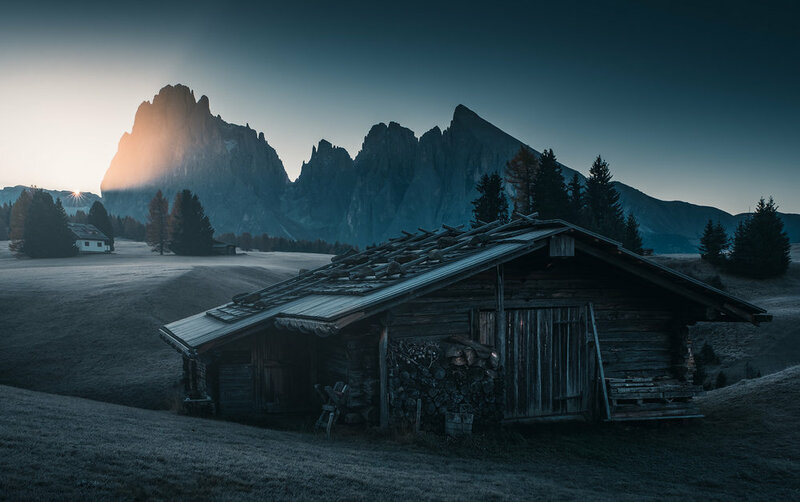 We’ll shoot both sunrise and sunset on the Alpe di Suisi with its incredible views of gently rolling grass-covered hills spotted with log cabins and pine trees below the jagged, rocky peaks of Sassalungo. From here we’ll also visit the beautiful Val di Funes where we can shoot the lovely churches of San Giovanni and Santa Maddalena beneath the Odle/Geisler massif at sunset. Late September is the best time to visit the Dolomites as many of the trees have started to turn a golden yellow. There's often great autumnal light and the main tourist season has passed leaving many of the locations much quieter and more peaceful. We may also be lucky enough to witness cloud inversions from up on the peaks as we look down from above at the cloud filled valleys below us. All our workshops are designed to ensure that you can focus on photography while we take care of everything else. Airport transfers, ideally located and comfortable accommodation as well as all your meals are all part of the package, and of course the tour is structured to maximize your opportunities to get great images whilst improving your skills as a photographer. 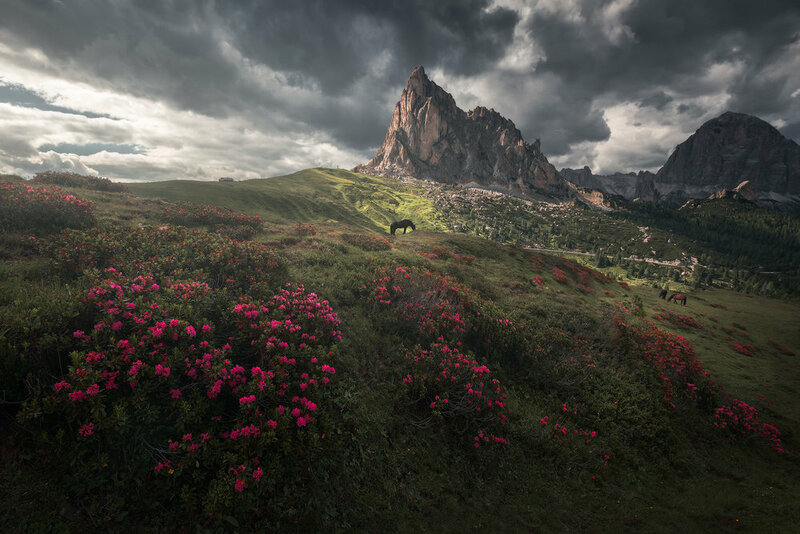 Andrea Livieri is local to the area and has been photographing and leading workshops in the Dolomites for years, while Andy Mumford has visited the area multiple times and knows the locations extremely well. We use all that experience and knowledge to get you to some of the Dolomite's most beautiful locations in the best light, and in the field we’re on hand to provide as much support, advice or guidance as you want. Some walking and hill climbs that should be within the capability of anyone with good fitness. For example some of the locations require walking for up to an hour with altitude gains of 100m. We visit the Dolomites by basing ourselves at two locations. While the dates that we’ll be in the bases are fixed, our time within those dates is flexible so we can decide which locations to visit while we’re there depending on the local weather and conditions. We will however ensure that we visit all of the locations in each area. At this time of year the sunrise is around 7h and sunset around 19h. 17h We’ll walk around the base of the peaks to capture the Tre Cime in the day's last light and at sunset. Afterwards we’ll have a hearty dinner together in one of the mountain rifugios in Tre Cime park and get to know each other better over some great local food. 11h30 Introduction post-processing session. Looking at getting the best from the images we took in the sunrise session early in the day and the sunset on the previous evening. Our post-processing sessions will be tailored to suit the differing levels and requirements of our clients and can range from Lightroom basics through to Photoshop Luminosity Masks and more advanced techniques. Because we have such small groups most of the post-processing sessions can be carried out on a one-to-one basis. 15h30 After lunch we’ll head up the winding road to Passo Giau where we'll capture last light and sunset against the jagged spires. Dinner will be when we’re back in the hotel around 20h30. 5h30 We’ll drive up to Passo Falzarego and make the short hike out to Lago Limides from where we can see the first light of day illuminating the surrounding peaks and reflected in the still waters of this beautiful alpine lake. 8h30 Breakfast at the hotel followed by a few hour's rest. 13h Lunch at the hotel before heading back to Tre Cime di Lavaredo where we have all afternoon to explore deeper into the park all the way to Locatelli, and find compositions for the sunset. 19h30 After sunset we’ll eat dinner in the restaurants of either Locatelli or Lavaredo mountain huts before heading back out to capture the stars above the peaks of the Tre Cime. 5h30 We’ll return to the Tre Cime national park, this time to capture first light and sunrise over the neighbouring Cadini peaks to the south. 11h30 Our second post-processing session. Looking at getting the best from the images we took in the sunrise session early in the day and sunset last night. Once again, this will be tailored to your needs. 15h30 After lunch we’ll take the road to the famous Cinque Torri, a row of five towering peaks of stone that dominate the surrounding forests. We’ll either have dinner at the nearby mountain rifugio or head back to eat at our hotel depending on what time we finish shooting. 5h30 We’ll return to the Tre Cime national park, once again heading towards a different part of this huge area to capture the day’s first light as it hits the towers. 11h30 Post-processing session. Looking at getting the best from the images we took in the sunrise session early in the day and sunset last night. Once again, this will be tailored to your needs. 15h30 After lunch and a short break we'll head out for our final sunset in the area with a trip to the northern side of the Tre Cime natural park. This time we’ll walk around the west side of the towers to explore compositions amongst the rocks and reflecting pools of the plateau to the north of the peaks. Every time we visit Tre Cime you’ll be struck by the huge variety of locations and views that can be shot from here, it really is such a magnificent place to shoot. 6h We’ll head to Lago Antorno where we can see the first light of day illuminate the peaks of the Tre Cime far above us reflected in the lake waters, or perhaps to the bigger Lago Misurina below the granite walls of the Sorapiss massif. 10h After breakfast we’ll get our stuff together to leave the hotel and head west to our second base on the Alpe di Siusi. On our way we may make a detour to stop at Lago di Braies and capture the turquoise waters of the lake in the gentle morning light. 13h We'll check into our rooms and have lunch. 6h For sunrise we’ll head back to Alpe di Siusi again, this time to see it with completely different light and hopefully with pockets of mist across the vast alpine meadow as the sun comes up behind the sheer peaks of Sassalungo. We’ll spend some time walking around capturing the location in beautiful early morning light before heading to our hotel for breakfast. 11h30 Our final post-processing session. Looking at getting the best from the images we’ve taken so far on the trip and putting what we’ve learned into practice before having lunch at the hotel..
16h As the light gets more attractive we'll head to nearby Val di Funes to capture the iconic San Giovanni church beneath the peaks of the Odle/Geisler massif illuminated by the golden light.. As the church of Santa Maddalena is relatively close well head there for the sunset and last light of day. 6h Depending on what time people need to arrive at Venice airport we’ll either finish with another sunrise on the Alpi di Siusi or have an early breakfast, check out of the hotel and take you back to Venice where we say our goodbyes. We also believe that having two shooting sessions a day means that participants get into a shooting rhythm and can quickly put into practice new skills as they are learned. We carefully select the dates of our workshops to try and make sure we are in each location at the best time of year. In the Dolomites for example the weather is still quite dependable in autumn with sunny days and crisp nights but the height of the tourist season is over with fewer people on the trails leaving the locations much quieter. Everywhere you look in the forests you’ll see that some of the trees are starting to turn a beautiful gold which really enhances their potential in images, but there’s still a feeling of life and lushness in the countryside. This adaptability also extends to the post processing sessions. We believe that editing is an integral part of getting the absolute best out of an image but we understand that the range of participant’s skill levels and familiarity with post processing techniques varies greatly. Because of this we make the most of having small groups to provide 1-to-1 editing sessions in the morning that are tailored to each participant's skill levels, and which can potentially range from the basics of editing a RAW file in programs like Lightroom to more complex techniques like using layers and luminosity masks in Photoshop. Finally, we want to share with you our passion for nature and landscape photography in this incredible place. We aim to make your experience here in the beautiful landscape of the Dolomites a memorable one and a trip from which, as well as getting some great images from amazing locations, you’ll also go home having had a true adventure with great company in a very special place. Reaching the locations on this tour should be well within the capacity of anyone with a good level of fitness but it’s worth taking a moment to point out that we will be photographing in the mountains and a certain amount of hiking will be required to get from where we leave our vehicle to some of our shooting locations. For example, reaching Forcella, the ridge at the eastern side of Tre Cime de Lavaredo requires around 40 minutes of walking, most of which is flat and along a very good trail, but there is an incline to the ridge at the end with an altitude gain of around 100m. The longest hike takes us to Rifugio Locatelli, which is around an hour and 40 minutes hiking with an altitude gain of 150m. Additionally, any altitude gain means that we’ll have to descend when we return, and after sunset this will be in the dark and using torchlight. There is nothing technical on any of the hikes and anyone with a reasonable level of fitness will be able to manage it, but it should also have a bearing on what camera equipment you bring with you as you’ll sometimes be carrying it for a couple of hours while we make these hikes so heavy packs should be avoided as much as possible. If you have any doubts whatsoever about your ability to participate, don’t hesitate to contact me using the form below. For some of the locations, particularly the lakes, a wide angle lens really is essential if you want to get those epic landscapes with a foreground that feels you can almost step right into it. 16mm or 17mm on a full frame camera (10mm or 12mm on an APS-C sensor camera) is ideal. We’ll often find ourselves shooting distant peaks or abstracts, which a telephoto is ideal for. A telephoto also compresses the landscape and is great for mountains when shooting from elevation. A range that covers 70-200mm (55-135mm on a crop sensor) is ideal. While these lenses are often the least useful for shooting landscapes, for the kind of locations we’ll be encountering in the Dolomites there may well be some occasions when the zooms listed above are too wide or too long and a mid-range zoom in the 24-70mm (18-55mm on a crop sensor) is perfect. A neutral density filter of at least 3 stops will help slow down the exposure to blur clouds and remove ripples from the lake’s surface. A graduated neutral density filter of 2 stops will also allow you to balance the exposure of the sky with it’s reflection in a lake. We’ll certainly be walking over rocky and uneven ground and we’ll also often find ourselves in muddy conditions so warm boots with good support and grip are essential. Even though it’s not winter yet it can still get pretty cold, particularly when up amongst the peaks at 2500m so warm clothes will help keep you comfortable while we’re out shooting. It’s best to layer, with a base layer next to the skin and then a fleece or thicker layer on top. 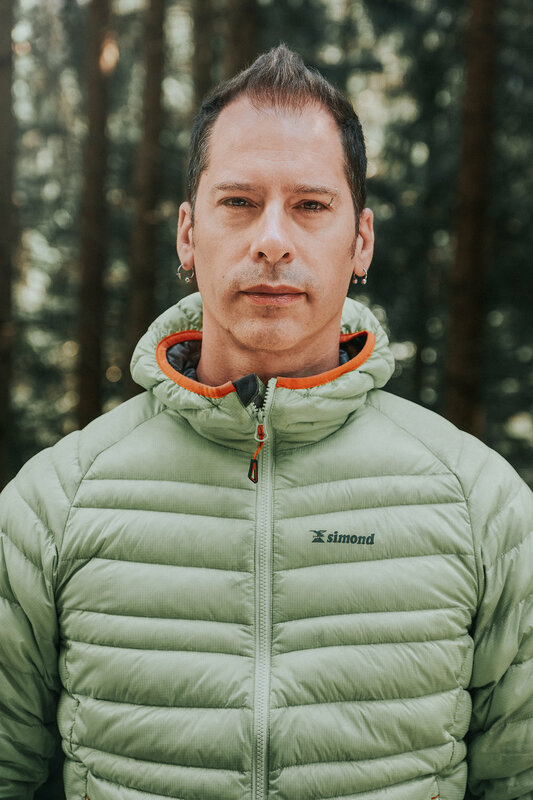 An insulated jacket on top of that will keep you warm, and also a waterproof or windproof shell as a final layer because there’ll certainly be times when the wind can be really strong in the mountains. To register for the workshop we require a €900 deposit. Please complete the form below for more information and please state which dates you're interested in.